Hannah Boozer, of Pendleton, inches her way across a ropes course at the Washington Family Ranch in Central Oregon. The Young Life camp was once a huge sheep ranch and later a spiritual retreat for followers of Bhagwan Shree Rajneesh. The Washington Family Ranch was a spiritual retreat for followers of Bhagwan Shree Rajneesh in the early 1980s. Rajneeshees clashed with the residents of nearby Antelope and others in the county over land rights. Campers at the Washington Family Ranch in Central Oregon zoom around the Young Life camp's go-kart course. The Washington Family Ranch, near Antelope, was once a huge sheep ranch and later a spiritual retreat for followers of the Bhagwan Shree Rajneesh. The Christian youth camp, owned by Young Life, opened in 1999. Three Pendleton teenagers take a ride on a giant swing called the Screamer at the Washington Family Ranch in Central Oregon. The Young Life camp was once a huge sheep ranch and later a spiritual retreat for followers of Bhagwan Shree Rajneesh. A camper at the Washington Family Ranch in Central Oregon picks his way up a climbing wall in the camp's 88,000-square-foot sports complex. Followers of Bhagwan Shree Rajneesh once worshiped their leader inside this building, which has been extensively remodeled. Campers at the Washington Family Ranch sing and pray during an evening session. The property was once a huge sheep ranch and then a spiritual retreat for followers of Bhagwan Shree Rajneesh before it became a Young Life camp. A camper at the Washington Family Ranch in Central Oregon somersaults off a floating trampoline into a manmade pond. The Young Life camp was once a huge sheep ranch and later a spiritual retreat for followers of Bhagwan Shree Rajneesh. The Washington Family Ranch in Central Oregon hosts about 1,100 campers every week. The Christian youth camp sits on the site of the former Rajneeshpuram. Hannah Boozer inched her way along a narrow cable, her eyes worried, her jaw set. The Pendleton teenager wore a harness and a lanyard that slid along an upper wire, so she knew she wouldn’t fall far. Still, a dizzying 50 feet stood between the 18-year-old and terra firma. Boozer, a camper at the world’s largest Young Life facility near Antelope, Oregon, was tackling the ropes course — a web of cables and ropes attached to utility poles set into a hilltop. The final station required a six-foot horizontal leap to a trapeze bar before she would be gently lowered to the ground. Had Boozer felt more relaxed, she might have taken a few moments to gaze at the scenery from her lofty position. The view encompassed Young Life’s Washington Family Ranch, a 64,000-acre Christian youth camp with a manmade lake, Olympic-size pool, three zip lines, go-kart track and an 88,000-square-foot sports center. About a mile away, in the middle school section, younger kids slid down tube slides at the camp’s water park. Every week, about 1,100 new campers arrive at the ranch. The oasis is surrounded by high desert flora and fauna. A gravel road leading to the camp slices through country rich with sage, juniper, greasewood and rimrock. The locals, many of them cattle ranchers, are rugged individuals who have weathered baking temperatures, middle-of-the-night calvings and the biggest irritant of all — the Bhagwan Shree Rajneesh. The Bhagwan, a spiritual leader from India, in 1981 established a commune on the land now occupied by the Young Life camp and what earlier was a large sheep and cattle concern called the Big Muddy Ranch. In the 1800s, a farmhouse still standing on the property served as a stagecoach stop. The Bhagwan bought the remote property for $5.75 million and invested millions more to build Rajneeshpuram as a spiritual retreat for thousands of his red-frocked followers. In news clips from the 1980s, Rajneeshees line the road for the Bhagwan’s daily drive-by in a vehicle from his fleet of more than 90 Rolls Royce automobiles. Rancho Rajneesh, as some called it, had its own newspaper, fire department, night club and mall. 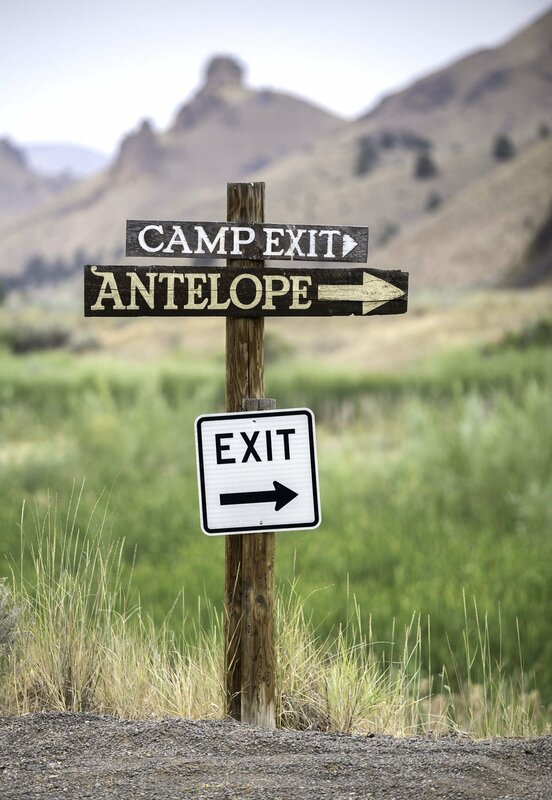 Patty Read, administrative systems assistant at the Washington Family Ranch, said the camp is a mixture of new construction and remodeled Rajneeshpuram buildings. The hotels were repurposed into dorms. The nightclub and mall are now a residence for workers. The transformation to a Christian camp is nothing short of ironic, said Pendleton Young Life leader Chris Thatcher. He and three other leaders shepherded a contingent of 28 Pendleton teens all last week. Thatcher stood in the sports center where kids scrambled up climbing walls and thudded basketballs off the hardwood. Once a place where thousands of Rajneeshees worshiped the Bhagwan, the center is a hub of recreational activity. He described the camp as a place where the gospel is presented, but not pushed. Seeds are planted during nightly meetings as kids sing and fellowship in a mosh pit-esque setting inside a building a short hop from the swimming pool. A pastor zings a short but pithy message. Thatcher said much of the faith building happens one on one. “We believe something real happens when you journey with a kid,” he said. If the camper isn’t interested in faith? “The brochures say this will be the best week of your life and they’re not lying,” Thomas said. Read is one of 40 year-round employees at the ranch. She serves as camp tour guide along with her other duties. The camp’s recent history includes some fascinating wrinkles. God, some say, sanded down some of the rough edges in the planning process. Early on, Read said, planners discussed creating a manmade lake, but ran into a big problem. The lake went on hold until a crew digging the swimming pool hit a natural spring with a flow of — you guessed it — 10,000 gallons per day. The camp’s huge grassy field, a place for soccer, volleyball and other activities, required several inches of sand to mitigate for muddiness. Someone on a four wheeler exploring the property discovered a huge sand deposit that provided the exact amount of sand needed. “This place is a gift,” Thatcher said. Hannah Boozer, once she conquered the ropes course, said she thinks the setting is a perfect place for getting close to God. Contact Kathy Aney at kaney@eastoregonian.com or call 541-966-0810.